A young boy, feeling neglected after the birth of his baby sister, discovers a rift in time that allows him to visit with both past and future versions of his family members as he navigates his way through parental conflicts and sibling rivalries. It's an undeniably compelling premise - rich with possibility and emotional sagacity. 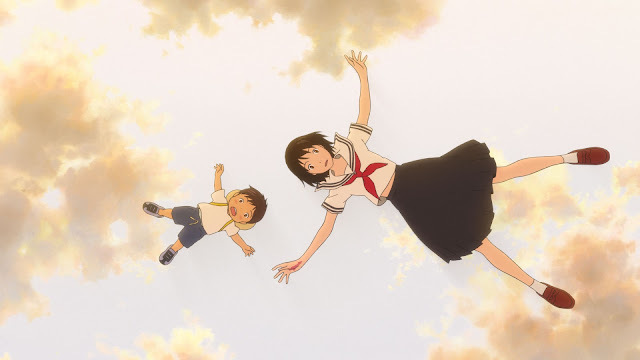 Yet Mirai, the latest film from Japanese filmmaker Mamoru Hosoda (Wolf Children), is caught in a strange kind of episodic structure that never really allows that premise to blossom in any sort of satisfying way. Our hero, four-year-old Kun (Jaden Waldman), is perhaps one of the most unlikable and abrasive protagonists to grace the screen in recent memory. He may only be a toddler, but his constant, wailing temper tantrums become tiresome after a while. Parents of small children may find themselves with a knowing smirk on their faces at that thought, but it makes for unpleasant viewing when the protagonist is just so hard to care about. The real heart and soul of the film is, as the title suggests, Kun's little sister, Mirai (Victoria Grace), who visits Kun in an older form and helps guide him through the avalanche of feelings that are overwhelming his young mind. Mirai, as both baby and teenager, represents Kun's future as both older brother and guide, yet here it is the younger sibling helping to teach the younger about responsibility sibling love. Kun also meets his mother as a young girl, discovering that she was often just as naughty as he (and that she learned many of her parenting techniques and bad habits from her own mother), as well as his grandfather as a young, uncovering the truth behind a long-held family legend about how he proposed to Kun's grandmother. These vignettes are often quite moving, yet they never really connect to one another, and Kun shows little character growth after each episode. No matter how many adventures he goes on with the older Mirai, he still seems to resent and even hate her in her younger form. The lack of growth means the film never really picks up any real momentum, so that even its most emotional segments don't quite land with the same power that they perhaps could have. It's beautifully animated, and the score by Masakatsu Takagi is lovely, but narratively it often feels like it's spinning its wheels. It exists mostly in a child's fantasy world, the parents (John Cho and Rebecca Hall) mostly clueless or distracted, but it seems to be missing a key component to hold it all together and connect its many threads. 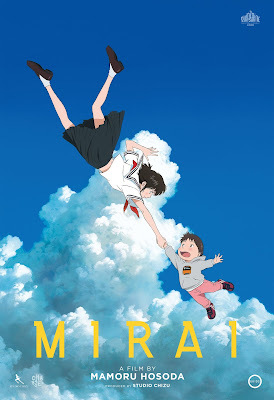 Anyone with a younger sibling (or an older one, for that matter) will likely find something to recognize in Mirai, especially in the way it connects the dots between the past and future of a family, each moment reverberating through time to create the people we are today. But it never quite figures out how to convey that in a way that ties all its myriad elements together. MIRAI | Directed by Mamoru Hosoda | Stars John Cho, Rebecca Hall, Victoria Grace, Jaden Waldman, Crispin Freeman | Rated PG for hematic elements including some scary images | Showing nationwide Dec. 5 and Dec. 8. Now playing in select cities. Click here for ticket information. Ooh! I must show this to my kids. They fight a lot and I want them to have a special bond between them. I know they love each other but there are times they even hate each other. I prefer showing them shows like the ones by Andy Yeatman that teach them good lessons.